Appearance: A huge amazonian woman with light blue skin, who has elf ears that are polygonal and triangular, and squared pupils in her eyes and black lips, black triangular nails, and white long flowing hair that lets out pixels from the hair's end. She has "V" tattoos on her shoulders, and a black top connected to her collar with black undergarments, complete with black boots and gloves. Likes: Fighting, Weapons, Training, Parties, Drinking, Meat; mostly Burgers. Personality: Very boisterous and getting knack on getting into fights, Virtua can act quite reckless. She also will have the respect on anyone who challenges her. She loves speaking in third person on a stereotypical Russian accent (minus the Russian words) and calls people with nicknames instead of their real names, but if things get serious, she'll drop it in favor for a more eloquent and sophisticated speech. She may be all muscle, but she ain't dumb, and is capable to use strategies to beat the enemy. If a party's running at the moment, expect her to come, because she'll definitely will if burgers are involved. She is quick and very strong enough to lift and hurl a truck with one hand, and has the ability to jump high. She also has tons of stamina. Her triangular ears provides good hearing for enemy presence. Virtua can also summon weapons to help her fight if things get very rough. However, she can only summon two weapons at a time. If she loses them, though, she can always make them come back to her hands. These weapons being: A sword, a shield, a whip, a boomerang, a spear, a hammer, an axe, and a bow & arrows. Not only she can perform wrestling moves, she can also fire balls of burning pixels from her hands. She can make them bigger if she charges them. Her skin is extremely tough - only something like a very sharp sword or lasers or someone as strong as her can pierce it. 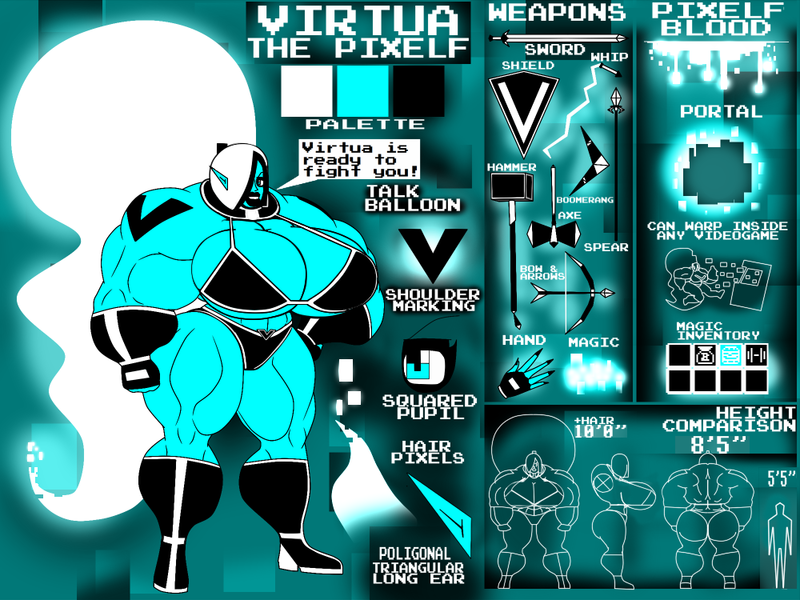 Virtua is capable to create portals to other areas, and she also has the ability to enter inside videogames or arcades to find more fights and challenges there. She can take anyone and anything with her too to the games. Virtua can also take anything with her from the videogames to the real world. Virtua also has healing magic, which, however, takes time for her to heal a wound. This serves for her to store items to use for later. But there are only at least 8 slots in there, but no matter how big it is, it can fill at least one slot. If it's something containing items like a luggage or a jar of cookies, it can still count as one item. -Weaknesses: She can be quite reckless and won't give up until either she or her opponent goes down. And her lack of armor and enormous size makes her an easy target for projectiles. And whenever she summons her inventory, she must think fast on what item to pick before becoming interrupted during a fight. As a Pixelf, if she gets wounded badly, she'll starts to gain static and glitches like a videogame, giving her a terrible disadvantage. Also, her hair and blood glow bright enough to give away where she might hide in the dark. Bio: She is part of a race called the Pixelf, beings who has videogame-like abilites who fought against evil polygonal-cyclops-like monsters called the Polyclops through different worlds. One of them, Virtua, a tough pixelf, was sent to explore a world: Earth. She had enjoyed the place, mostly because of burgers, and decided to stay there, as the place had a lot of danger and things she found challenging to fight. -Her white blood can glow in the dark briefly whenever it's spilled. -Should a Pixelf die, they disappear on a glowing explosion, leaving behind items they had in their inventory. -The Vs may stand for Virtua, but they're actually the Pixelf's symbol.